As a photographer and stylist, I love anything that I can make individual sized. Hang on. Scratch that. As an eater, I love anything that I can make individual sized too. Especially desserts. Especially those that are cakelike, where I might just prefer a slightly higher crust-to-center ratio. Brownies are no exception, which is why, perhaps, I am tempted every time I walk past those two-bite brownies in the little buckets they sell at Whole Foods. I’ve decided that when they say two bite, they don’t mean it takes two bites to eat them. They mean, you will have two, bite sized brownies anytime you spot them. Last night, with some last minute company coming over, I whipped up a batch of Donna Hay’s version, with a few tweaks of my own. The recipe called for cooking the brownies individual sized, 4oz, non-stick cups. Now, I have a lot of props and a lot of bakeware, but nothing that quite fit that description. So, instead, I decided to make the brownies in oven-safe espresso cups knowing good and well that they wouldn’t just pop out, but would be lovely to eat with a spoon, almost like a molten chocolate cake. To change it up a bit more, I also added a good shake of cinnamon to the batter. I love the subtle heat that the cinnamon adds to chocolate dishes. Each little cup it’s own spoonful of densely dark, spicy chocolatey goodness. It’s really hard to go wrong with that. Of course, you can make these as bite sized brownies too… a mini muffin pan works beautifully for that, you’ll just make about 2 dozen rather than the 9 that the recipe makes. Keep an eye on them as they bake, so you don’t dry them out. Blend butter and sugar in a mixer until pale and creamy. Then, mix in the remaining ingredients until just combined. Spoon the batter in to oven-safe cups that are 4 to 6 oz in size. You can use ramekins, of course… or, see if you have any tea or espresso cups that will work. I have these that I love. Fill to top, and smooth with a spatula. Bake for about 12 to 15 minutes, depending on the size of your cups. The cakes should be set on the top, but still very soft and moist in the center. If you wait until you can insert a knife and it comes out clean, you’ve waited too long. Let the brownies sit for a few minutes, but serve while still warm, ideally with a scoop of vanilla ice cream, or a shot of espresso. Makes between 4 and 8 cups, depending on cup size. This entry was posted in Dinners, Food, Recipe, Sweet. Bookmark the permalink. OMG! I need this at 8:21 p.m. like I need a hole in the head. yum! love the cups idea. Those look amazing. I can just imagine you scraping the full top of the cups with a ooey-goowy chocolate batter covered spatula. They look like they’ll fix a serious chocolate craving for sure. Great work! I too love bite-sized baked goods – my goodness, your photographs are always so stunning!! brilliant!! I have to try these in the mini muffin pans- bite size temptations are much easier to handle! Where did you find the oven proof cups? these look mah-velous. 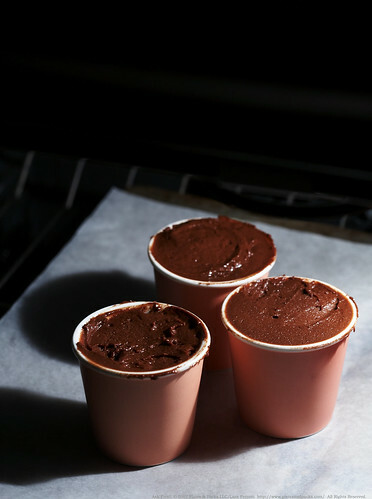 I love the idea of using the oven-proof cups. 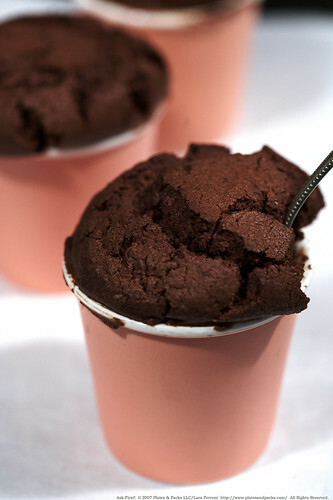 Lovely idea of making this muffin-like cake in a cup and to serve with spoons. Makes life much easier. OMG! That looks so lovely….it made me eat a chocolate bar at 12:39 a.m!!!! i like the idea of making them in cups. never thought brownie – cup – spoon! brilliant. They look absolutely divine, Lara! Mm~ You’ve got me craving for brownies at 11pm! My oh my, do those look good…maybe this’ll be my treat this weekend! Ah! Someone else who has discovered the amazing Donna Hay! LOVE everything in all of her books and magazines–you can’t go wrong with Donna! These look fantastic. P.S. Love the new blog design. User friendly with the old posts on the side, stylish and beautifull. Haha, I must say that’s pretty cute. I would like my brownie in a cup too please 🙂 Question though, does that increase the crust-to-center ratio? Do the edges of the cup make for crispier brownie because I would imagine only the top tastes like crispy brownie. lara, what a stunner! i am sooo using this for my next catering! brownies as fingerfood are a non-brainer… but what to do for a stylish fingerfood party where nobody wants to get their hands dirty? no here’s the solution! I agree, I love bite sized anything! These brownies are simply too cute to resist. Your pink espresso cups are just lovely and I’m duly impressed with the simplicity of Donna Hay’s brownie recipe. Looking forward to giving these a go in my mini-muffin pan! The first thing I did was bookmark this recipe. I may just have to try it this weekend! I don’t have adorable (and oven-safe!) espresso cups, but do you think that ramekins would work? Otherwise I may have to invest in a mini-muffin pan! Thanks for the recipe and beautiful pics! They actually look like whimsical paper cups! Were they still batter-y in the middle? I think I’d love them more if they were! And as for the recipe… Y.U.M. Such a creative and delightful way to enjoy chocolatey goodness. Oh, this is the perfect bake and go brownie! Thanks everyone for your comments and lovely words! The oven proof espresso cups are available now at Crate & Barrel in white and brown. I found mine about 6 months ago online. The are made by a company called ASA Selection, and are the Hot + Fresh line. I have pink, yellow and blue (and now the brown from Crate & Barrel). The brownies should stay moist inside, but they are very, very easy to overcook! In fact, I did. So be really careful on the cooking time, just like you would normal brownies. When the top starts to feel a baked and set, they are probably done. Don’t wait till a fork inserted comes out clean. Ramekins should work fine, but try to find some that are higher sided for a similar effect. On the crust to center ratio, there is more crust. The top crust, admittedly is the yummiest in my opinion, but the edges in the cup get crusty too. I should have mentioned also that this recipe is for a more cake-like brownie. But, I think any brownie recipe should work baked in cups. At least worth giving a try! This is not at all a good thing to look at at midnight! Your beautiful photographs are evoking all kinds of undisciplined desires right now…I will even take them “unbaked”.. They look seriously delish. Like the idea of serving them in espresso cups. Très chic! Did you use fairtrade chocolate? They would make a great entry for the Stop the Traffik chocolate compeition . Yes, or at least slave free. The chocolate for this was Dagoba (see http://www.dagobachocolate.com/files/faqs/sourcestrade.html). Your chocolate competition looks great! I’ll have to see if I can come up with something else here in a day or two. This looks wonderful. I would love to do a feature just like this. These brownies looks sooo good ! I tried these…so delicious..and the middle is the best bit not the crust as argued above! I just made a half-batch of these in the same adorable cups and they were the perfect thing for a freezing cold single-digit day like today. Mine just didn’t look nearly as pretty as yours because a half-batch didn’t quite fill up four of the cups. Just found your blog through PPSOP. Wow!